PROVIDE SAFE, RELIABLE SURGE PROTECTION IN HARSH ENVIRONMENTS: This eight outlet metal surge suppressor is designed to provide safe, reliable surge protection in harsh environments. A high 1500 joule rating can protect connected equipment against damaging surges, spikes and line noise. This is the perfect surge suppressor for keeping your crew and your equipment safe! 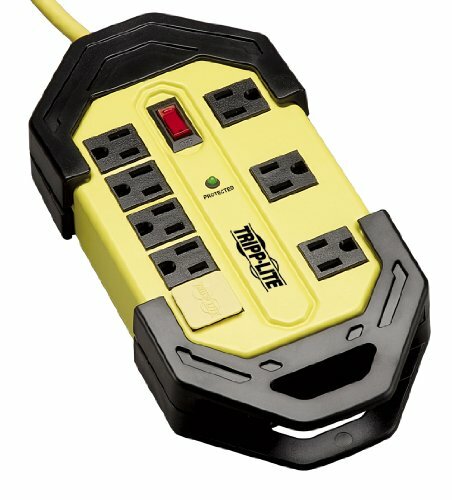 HEAVY DUTY, OSHA-COMPLIANT MULTI OUTLET SURGE WITH 12′ CORD: Eight outlets protect connected equipment, two of which are designed for bulky transformer plugs. Enjoy an extra long 12′ grounded cord with an integrated cord wrap to simplify cord management. As an added safety feature, the surge suppressor’s bright yellow color (OSHA-COMPLIANT) alerts you and others that power cords and tools are in use. SAFETY FIRST! HIGH JOULE-RATING + PREMIUM SAFETY FEATURES: 1500 joules means maximum protection for your equipment. A lighted on/off switch with integrated circuit breaker provides power control over connected equipment. Breaker protects against dangerous system overload. Protected LED confirms that connected equipment is being protected. 4 safety covers shield unused outlets from debris and accidental contact. BUILT-IN CORD WRAP & HANG HOLES FOR CONVENIENT MOUNTING OPTIONS: Surge protector heavy duty features include a rugged metal case stands up to the harshest environments. Built-in cord wrap with hang holes provides convenient cord management. Integrated keyhole slots on bottom panel provide convenient wall/desk mounting.